My father, on the right, died in the early ‘60s, in his early ‘40s. He was an engineer who switched to management and did rather well. Following WW2, he left the army to study engineering. 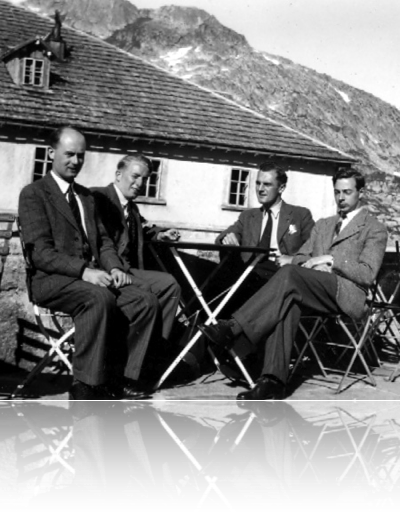 In August 1948, he took an IEE (now IET) student tour of Switzerland. His tour photo album is engineering enthusiasm: railways, locomotives, maps, dams, geography, sights, and no pretty girls. He was, as I am, a nerd. The album is postcards and curate’s snaps. It’s fascinating for me; he’s a man I never knew. He shoots what I would have shot. But he’s different: I’m fascinated by railways as lines in landscape, he’s fascinated by locomotives. Among the place and enthusiasm are fellow students. Most shots are count–the–heads hide–the–personality poses, but the guys enjoyed themselves. I’m glad. Sixty years later, I’ve scanned his album. It’s an interesting vision of the time, it might interest surviving fellow students. Most of all, though, it’s a portrait of a young man in 1948, a photographer, an editor. It’s here. Photosets include index, itinerary, menu, airolo, arth, goldau & rigi, baden, basel, bern, dieppe, furka pass, rhône glacier, giswil, st gotthard pass, grimsell pass, neuchâtel, reuss valley, rheinfalls at neuhausen, switzerland, lake thun, unvisited, zug & zürich.